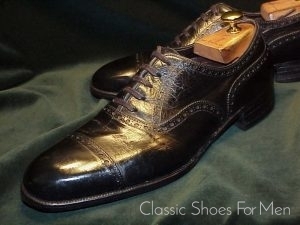 This marvellous custom-made 5-Button Shoe is certainly a collector’s item and a beautifully and, today, rare example of the old style of shoe making. It is difficult to compare it to anything modern beyond, perhaps, Dinkelacker’s admittedly fine but somewhat exaggerated workmanship. This shoe presents the traditional Central European toe-box and massive build quality while avoiding the hyperbolic styling of the other. Little is known about this particular shoe beyond the fineness of its making, that it is of Hungary origin and the product of a master shoemaker. 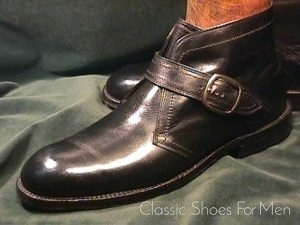 The full-leather lining suggest a relatively modern date but the use of wooden nails to fasten the sole to the body is a technique long fallen from grace. 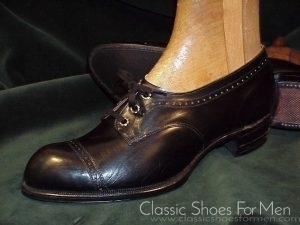 Recent or antique, this is a shoe from another era of shoemaking and another “technology”, the rarely-to-be-seen-today ancestor of the great contemporary shoemakers of Munich, Vienna and Budapest. This masterwork harkens to the days and ways of the K.und K. It is an historically important and still eminently wearable museum piece destined for the advanced collector. Finest velour suede over boxcalf. 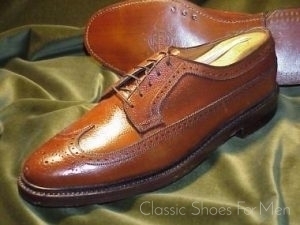 (custom-made, thus unmarked for size, however measured with shoemaker's lasts of known size): 43-43.5E .......UK9F ........US10E, for the medium to somewhat wider foot. Superb! Beautifully functionable condition, showing trivial wear to newly added thin rubber protective bottoms and heels, and none to tops.